After you’ve picked the place you want to put up your office in, the next step would be to prepare a contract/lease for occupying the property. You should pay close attention to the terms and clauses that go into the contract. Let’s take a look at the things you need to know about commercial lease for office. Leasing a property is the best choice when you can’t afford to buy one or it financially not a wise choice. Any individual, business owner or company wishing to take up a property to use as an office can make use of a commercial office lease. So if you are the owner of a property apt for office use or if you are an individual who wants to lease a property for office use, commercial office lease is what you need. Office space leases can also be signed between companies when one company requests the use of a part of the other company’s office space for the former’s use. Ideally, the lease should be prepared one or two months before the previous tenant vacates. This would leave room for both parties to update their clauses. Companies or individuals who wish to occupy a property to set up their office in it can use an office space lease. As long as an individual is 18+ in age, they can lease a property in their name. Proprietors can create agreements in their own name, however, companies or partnership firms must always use their registered business name in the contract. Companies who want to lease an office space too can make use of this commercial lease. In such cases, the name of the company will be used in place of Tenant. What Should Be Included In The Lease/ Rental Agreement? Commercial leases are regulated by the Rent Control Act, so you might as well pay attention to what goes into your contract. Whatever is written is legally binding. Hence you may want to make sure that you don’t miss the following clauses. Print the document on stamp paper of recommended value. Each state has its own guidance on stamp duty charges. Keep in mind that leases for a period of over a year must be compulsorily registered at the Sub-Registrar’s office. The tenant and landlord must place their initials on all pages and signature on the last page designated for signature. The witnesses must place their signatures at designated places. Tenant will pay for stamp charges and keep the original copy of the agreement. Landlord keeps the duplicate copy. Alternatively, you can buy two sets of stamp papers and both parties can keep one copy. Most commercial leases do not stick to a standard format. However, like most legal documents, office space leases also require some basic elements to make them legally valid. The names and addresses of the landlord, tenant and the property intended to be leased out must be clearly spelled in the contract. Any change in the spelling can cause unnecessary headaches. Term of the lease, lump sum/ rent to be paid to the landlord and its interval, clauses agreed upon between landlord and tenant and other important conditions must be clearly mentioned in the contract. Vague or obsolete clauses leave everyone in a contract vulnerable should a dispute arise. 1. Is it vital to mention the nature of business in the office space lease? Not really unless you feel absolutely necessary otherwise. The tenant can go from head hunting to real estate within the same office but that does not break rules. So unless the Landlord is particular about the nature of business being conducted on his property, you need not mention it explicitly. 2. What is the typical duration of a commercial office space lease? No fixed answer for this one. They can range from few months to several years. As they are concerned with businesses and are slightly different from rental agreements, they don’t follow a standard format. However, leases with a duration of more than a year must be registered mandatorily with the Sub-Registrar’s office. Signing a badly prepared lease is worse than having no lease at all. We cannot warn you enough about the dangers that lurk within the clauses of a contract if the lease is not drafted with the help of a legal expert. 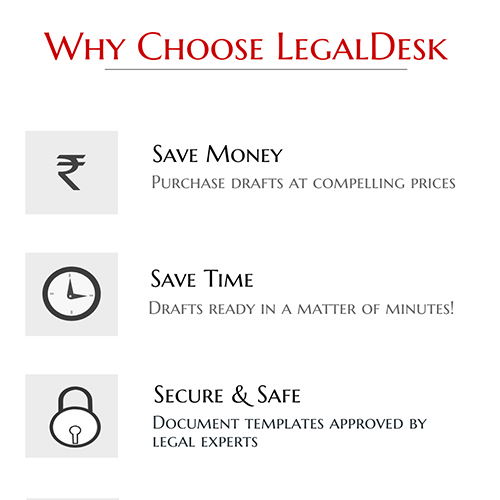 LegalDesk.com offers comprehensive, expert verified, pre-drafted commercial office space leases which can be prepared in a matter of minutes. All you need to do is fill in names, addresses and other relevant details. We will print the document on stamp paper of recommended value and courier it to an address of your choice. However, you can buy a soft copy and do the printing yourself too. Now, is that not great? Try creating one right away!